A free search of a court index that’s more flexible than the one at the county court site is a desirable investigative tool, right? You may start seeing results from your Google name searches pointing you to the website UniCourt. Perhaps that’s because the database has gone from a collection of 5 million indexed records to 31 million in the past few years. This is a subscription service with monthly fees to use the full features. So I’ll just mention the free aspect. Search across multiple state and federal jurisdictions by participant name, attorney, case and keyword. Federal courts are extensively represented but there are only a few state-level ones indexed. So, the site is only particularly useful. However, if you’re looking for a case that you thought was filed in San Francisco state court but was filed in San Joaquin, that will pop up. Have you ever searched for a case at the San Francisco Court Civil Case Information Search and received this frustrating message: “No cases for XXXXXXX, XXXX available for public viewing.” That doesn’t indicate that there’s no case by that name, just that the docket isn’t available through the name search. You’ll find that’s the situation with family law matters. If you have the case number, the court site will return the docket. UniCourt addresses that obstacle. Retrieve the case information from the official court site to get more details, such as party addresses. Find cases in which an attorney has represented litigants by conducting the same name search and then filtering the results by attorney. You can further filter by jurisdiction. To ensure free use of the site, be sure to clear your cookies each time. This entry was posted in Public Records. Bookmark the permalink. THANK YOU!! That’s a good one. Keep up the good work as usual. Hi Tamara, thank you for mentioning this. I have noticed UniCourt but never looked at it seriously. It’s true I found some San Francisco civil case dockets just now that are otherwise “not available for public viewing.” This is so good to know! 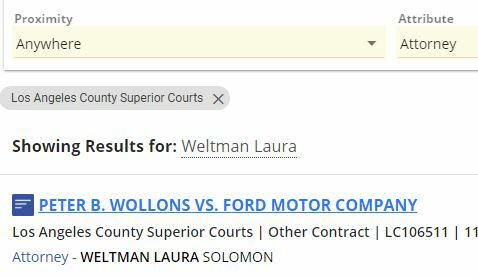 But I didn’t find anything in UniCourt on a subject who has cases in a couple other cities and states, so I still had to go directly to those court sites. But UniCourt has just been added my bookmarks.